Review: "Baron: Torpor" - Sea of Tranquility - The Web Destination for Progressive Music! 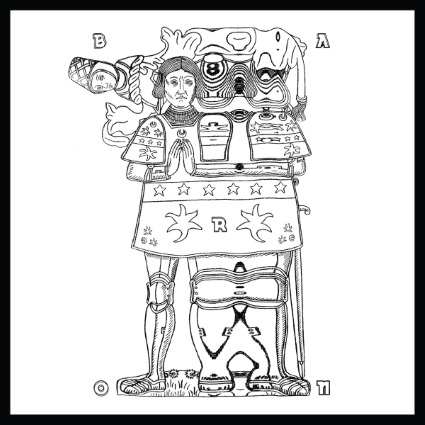 Torpor is the latest Svart Records release from the British quartet known as Baron, which contains 8 songs that fluctuate between '60s psychedelia and '70s space rock. Highlighted by haunting organ, strong vocals, and sizzling guitar leads, the arrangements concentrate on dreamy atmospherics and an overall melancholy feel throughout. Considering all the eclectic artists on the Svart roster, Baron fits in quite nicely. "Mark Maker" and "Wild Cry" float eerily along, Alex Crispin's vocals popping in and out of the mix of swirling organ and lilting guitar chords, while "Dragonfly" seems lifted from The Doors playbook, complete with a scorching guitar solo to close the song out. "Dark Down" is mightily creepy, but there's a sense of beauty about it as well, and the lengthy "Stry" mixes in some post rock atmospherics for good measure before a thunderous wall of metallic sound builds out the climax. On "Sleepless" that band again dips into their metal bag of tricks, combined with some lush, folky elements, for a really intriguing piece that just might be the 'sleeper' track on Torpor. Another great song is "Deeper Align", which kicks off in upbeat stoner rock fashion before unsettling doom and space rock passages take the song into nightmarish territory, complete with some truly ominous guitar riffs. The chilling "Albedo Dei" closes things out, another eerie piece with post rock, prog, doom, psych, and space rock leanings, but yet encompassing none of those styles. It kind of describes the whole album, which is very unlike anything I've heard this year; satisfying, yet quite odd and different at the same time. In the end, Torpor is an easy album to recommend, but I guarantee it won't be an easy listen, at least not at first. It's dense, yet airy, heavy, yet light, ominous, yet uplifting...give it a try, and be prepared to be as intrigued as I was.